Sarcopenia is an age related syndrome that results in loss of the skeletal muscle, strength, quality and subsequently its function. People above age of 70 have a higher risk of developing this syndrome due to reduced physical activity. However, it may also result in people who stay physically active. Symptoms include weakness and loss of stamina. This condition can be treated by incorporating exercise into the lifestyle or by medication. 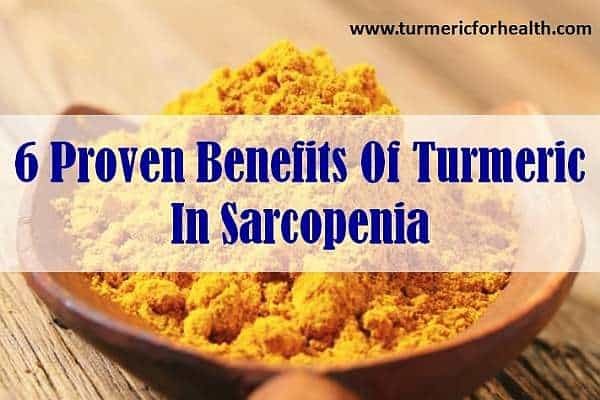 However, research studies have found that the consumption of turmeric on a regular basis can treat sarcopenia and conditions related to it. 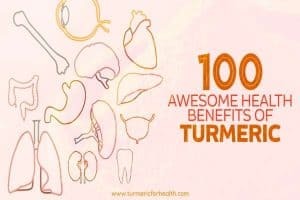 Turmeric has been used as a medicine for the past many years. It is popularly used as a spice in Asian countries and provides a bright yellow tone to the foods. It has an earthy taste and is used commonly in curries and rice dishes. Turmeric has extremely beneficial properties when it comes to treating ailments. The Ayurveda has used turmeric for the past thousand years to cure a variety of ailments like inflammatory disorders, autoimmune disorders and much more. Turmeric and its active ingredient agent, curcumin helps in muscle regeneration which serves to be therapeutic in sarcopenia. Fatigue is a common symptom of sarcopenia. Sarcopenia leads to loss of strength and impaired mobility which increase the risk of mortality. It has been found that curcumin has a beneficial role in alleviating fatigue. According to a study published in the Nutrients in 2015, the supplementation of curcumin was evaluated to study the effect of fatigue and physical performance. The results of the study indicated that curcumin increases the muscle glycogen content which is an important source of energy. It did not produce any toxicity. The study concluded that curcumin improves exercise performance and prevents fatigue. Another study conducted by Cox et al. in 2015 investigated the effect of curcumin on various parameters including fatigue in healthy patients. The results suggested that curcumin supplementation was found to relieve fatigue and made the individuals feel significantly better. Curcumin can alleviate fatigue in patients with sarcopenia and improve their physical performance. Research studies published in Evidence based Complementary and Alternative medicine suggest that curcumin, active ingredient present in turmeric reduces inflammation and reduce muscle damage caused by exercise. Curcumin was found to reduce the release of proinflammatory cytokines and creatine kinase. Six human clinical trials conducted by Chainani-Wu et al. in 2004 demonstrated that curcumin has anti-inflammatory properties that can inhibit the release of inflammatory molecules like interleukins. The study also showed that its administration for 3 months caused no toxicity concluding that it is safe for consumption. The anti-inflammatory properties of turmeric especially curcuminoids present in it can help in treating inflammatory rheumatoid arthritis hence reducing the risk of developing sarcopenia. Turmeric has anti-inflammatory properties that can be helpful in treating inflammation in the skeletal muscles in sarcopenia. It can further prevent inflammation in rheumatoid arthritis reducing the risk of developing sarcopenia. Experimental studies published by Rondanelli et al. in 2016 show that curcumin inhibits the activation of nuclear factor-kappa which may provide a muscle-protective effect as nuclear factor-kappa B appears to be involved in proteolysis and inflammation of the muscle. It has also been suggested that curcumin may reduce the risk of sepsis and development of endotoxemia. This property could help in regenerating muscle damaged by a traumatic injury. It has often been seen that skeletal muscle is very vulnerable to tissue injuries thereby increasing the risk of sarcopenia for patients with muscle or tissue damage. A study conducted by Thaloor et al. in 1999 showed that curcumin administration affects transcription factors that regulate the activity of the muscle tissue and myogenesis thereby helping in muscle repair. Results suggested that Curcumin initiates myogenesis in the muscle tissue which is beneficial for treating injuries in the muscle and sarcopenia. Curcumin present in turmeric has therapeutic properties for regeneration of muscle. This can be helpful for treating injuries as well as muscle loss associated with sarcopenia. Sarcopenia often leads to poor wound healing. Thus consuming or applying turmeric on wounds can help in faster wound healing for patients suffering from sarcopenia. Curcumin is known for its wound healing properties. An observational study published in Life Sciences on 2014 reported that curcumin could reduce inflammation and oxidation to wounds. The study concluded that curcumin shows maximum therapeutic effects for healing skin wounds. Another study conducted by Tejada et al. in 2016 reported that curcumin stimulated the production of certain growth factors that accelerate wound healing. Curcumin exerts wound healing properties that stimulate the production of growth factors that initiate the faster healing process. Since sarcopenia inhibits healing of wounds by the loss of muscle mass, consumption of turmeric in this condition will play an important role in the treatment of patients suffering from muscle or tissue damage. The development of sarcopenia may also occur as a result of oxidative stress. Increased oxidative stress may lead to loss of muscle mass and function with age. Curcumin has been known for its antioxidant properties. 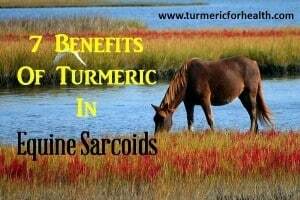 Hence, consumption of turmeric can reduce oxidative stress in patients with sarcopenia. In an animal study carried out by Receno et al. in 2016, administration of curcumin was found to increase antioxidant expression in skeletal muscle cells. The study concluded the possibility of curcumin to be effective in treating oxidative stress associated with sarcopenia. Another study conducted by the Syracuse University showed that curcumin reduces the risk of development of sarcopenia by acting as an iron chelator and increases the activation of certain biochemical factors thus upregulating antioxidant effect. Curcumin may also play an important role in altering the oxidation status of the skeletal muscle, thus causing changes in muscle mass and function. Since oxidative stress plays an important role in the progression of sarcopenia, patients with this condition must increase consumption of antioxidants in their diet. 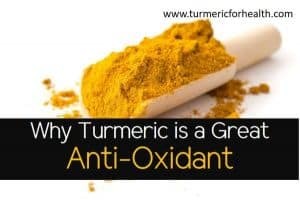 Turmeric has effective antioxidant properties which can be used to reduce oxidative stress in the skeletal muscles hence alleviating the condition. Research suggests that sarcopenia is likely to develop in patients with rheumatoid arthritis. 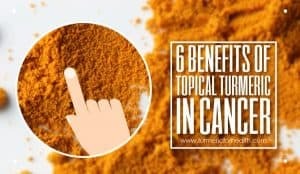 A study published by the National Center for Integrative Health reported that curcuminoids, when extracted from turmeric, were highly effective in treating rheumatoid arthritis even at low doses. The study concluded that turmeric could be used for treating inflammatory disorders like rheumatoid arthritis. Another study published by the University of Arizona Health Sciences Center showed that turmeric dietary supplements contain turmeric extracts that have anti-arthritic efficacy and can effectively cure arthritis. It can prevent joint inflammation as seen in rheumatoid arthritis. The study also showed that these dietary supplements had the same mechanism of action as anti-arthritic drugs. According to a pilot study conducted by Chandran et al. in 2012 on 45 patients with rheumatoid arthritis it was suggested that administration of curcumin was highly effective and safe in curing rheumatoid arthritis and improvement was seen in these patients as compared to those in the control group. Another study published in Indian Journal of Medical Research in 2013 and conducted on 18 patients with rheumatoid arthritis reported the antirheumatic activity of curcumin. The study involved administration of curcumin at a specific dose for two weeks and followed by comparing the results with the control group which was administered with an antirheumatic drug, phenylbutazone. A significant improvement was found in both the cases indicating that curcumin has similar mechanisms as that of the antirheumatic drug indicating its effectiveness and use in place of such drugs that pose a higher risk of causing side effects. Curcumin being a natural extract has less toxicity and is considered safe for daily consumption. Turmeric contains active compounds like curcuminoids which have anti-arthritic efficacy and can treat rheumatoid arthritis as well as the inflammation associated with the condition. It follows the same mechanism of action as anti-arthritic drugs, and it can be used instead of the drugs to avoid side effects or toxicity since it is a natural extract. No specific dose of turmeric has been prescribed for sarcopenia. Dietary turmeric is considered safe, and its inclusion in the diet on a regular basis can be effective for patients suffering from this condition. Consumption of turmeric must start with small doses such as ¼-1/2 tsp a day for a week and if no gastric side effects are seen increase the intake gradually by ¼-1/2 tsp every week. The recommend dose is 1-2 tsp 2-3 times a day (precisely 1 tsp 3 times a day). Turmeric has been popular for its therapeutic properties for the past several decades. It exhibits various benefits that can be used as a treatment for sarcopenia and conditions related to it. It can be very helpful especially for aging. It can reduce their risk of developing sarcopenia.